This is book 2 of the Peter Grant series. Okay, yes, so my reading list contains a whole bunch of non-fiction books, to balance out the copious fiction I've been reading as of late. Except that I enjoyed Midnight Riot so much, that I ignored my entire reading list, expecting I could squeeze this book in before the next book on my list becomes due in 12 days. And hey, I managed it! As I enjoyed the last Peter Grant book, I also enjoyed this Peter Grant book. 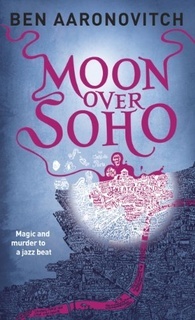 The humour flavor isn't quite Dresden, clearly my reading yardstick for urban fantasy, but Aaronovitch still does the Talking To The Camera / Breaking The Fourth Wall style really well. The humour is drier than Dresden, but still great. What I am particularly enjoying with the Grant series so far, other than the world building, the magic rules, Grant's scientific inquiry instead of mere acceptance of magic, and the dry wit, are the history lessons. Aaronovitch drops names and events into casual conversation and I'm left wondering, "Wait, what?" Off to Wikipedia I go, and, oh, there's the Great Stink, Tacitus, the sons of Mūsā ibn Shākir, and the Thief-Taker General Jonathan Wild. History lessons dropped into casual conversations that are completely fascinating! I'm pretty sure once I finish the current 10 book reading list I have to clear the library holds I currently have, I'm going to rip through the next 5 Peter Grant books. Totally enjoying them, strongly recommended so far for fans of urban fantasy. I knew all this because I’d been reading the Annals of Tacitus as part of my Latin training. He’s surprisingly sympathetic to the revolting Brits and scathing about the unpreparedness of the Roman generals who thought more of what was agreeable than expedient. Whatever you see, he’d said, take as long a look as you need to get used to it, to accept it, and then move on as if nothing has changed. EVERY HOSPITAL I’ve ever been to has had the same smell, that whiff of disinfectant, vomit, and mortality. “Do I have a signature?” I asked. The sons of Mūsā ibn Shākir were bright and bold and if they hadn’t been Muslims would have probably gone on to be the patron saints of techno-geeks. They’re famous for their ninth-century Baghdad bestseller, a compendium of ingenious mechanical devices that they imaginatively titled Kitab al-Hiyal—The Book of Ingenious Devices. This is one I looked up. Fascinating! And what do Nightingale and I have to measure vestigia with? When I read books, I listen to the audiobook when I'm out and about (usually walking) or doing errands or chores (raking leaves, washing dishes, etc.). I much prefer to read the words than to listen to the words, but when a story is engrossing, I want to keep going. I happened to be listening to the book as I was reading it, and, oh, there are significant differences between the British and Amercian versions of the book. The ebook American version has "Nightingale and I," whereas the British audiobook has "me and Nightingale." I have to say the "me and _______" form drives me nuts. It is an emerging speech pattern that makes me want to go all grammarian on people's asses when they use it. New pet peeve, I guess. In 1986 Courtney Pine released Journey to the Urge Within and suddenly jazz was back in fashion and with it came my dad’s third and last brush with fame and fortune. Well, I guess I have a new album to consume now. My dad always said that a trumpet player likes to aim his weapon at the audience, but a sax man likes to cut a good profile and that he always has a favorite side. It being an article of faith with my dad that you don’t even pick up a reed instrument unless you’re vain about the shape your face makes when you’re blowing down it. I’ve never been what you’d call a strong swimmer but if the alternative is being a statistic it’s amazing what you can pull out of the reserves. People don’t like to speak ill of the dead even when they’re monsters, let alone when they’re loved ones. People like to forget any bad things that someone did and why should they remember? It’s not like they’re going to do it again. The central atrium at the Trocadero Centre is four stories high with an open basement that added another story to the fall. The space is crisscrossed at random intervals by escalators, presumably because the architects felt that disorientation and an inability to find the toilets were integral parts of the shopping experience. “What made you think Ty would tell you?” asked Nightingale. “She couldn’t help herself,” I said. “First law of gossip—there’s no point knowing something if somebody else doesn’t know you know it. You don’t experience a bomb blast so much as remember it afterward. It’s like a bad edit or a record jumping a groove. On one side of the moment there is music and laughter and romance and on the other—not pain, that comes later, but a stunned incomprehension. It’s weird watching an elderly parent when he’s half naked. You find yourself staring in fascination at the slack skin, the wrinkles, and the liver spots, and thinking—one day all that will be yours. I grabbed her wrist and twisted her knife hand up and away. The rule for fighting a person with a knife is to start off by making it point away from you and then ensure that it hurts too much to hold on to. Whatever you’ve been told, seeing is not believing. Your brain does a great deal of interpretation before it deigns to let your consciousness know what the hell is going on. If we’re suddenly exposed to something unfamiliar, a damaged human face, a car flying through the air toward us, something that looks almost but not quite human, it can take time, sometimes even seconds, for our minds to react. This is an example of the fourth wall explanation thingy that I enjoy. It’s no fun looking down on people if you can’t let them know you’re above them. I’d been working on loosening the chimney stack with what I call impello vibrato, but Nightingale called will you stop messing about and pay attention, while Faceless had been chatting. For a terrifying moment I thought he was going to hug me, but fortunately we both remembered we were English just in time. Still, it was a close call. You do this because it is your job, because it’s necessary, and because, if you’re honest, you love it. Repeat this process until the bad dreams stop or you just get used to them—whichever comes first.